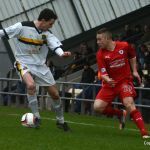 Raith Rovers ended their three game losing streak after an entertaining 3-3 draw with Dumbarton at the Bet Butler Stadium. 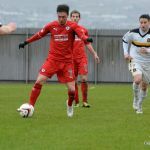 Manager Grant Murray made both personnel and formation changes from the side that had lost against Hamilton the previous week. 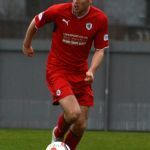 Fraser Mullen, Liam Fox, Dougie Hill and Greig Spence all made way, as the team reverted back to 4-4-2, the same system which they ended up in last weekend. 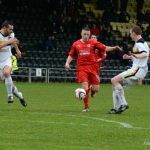 Jason Thomson moved back to his more natural right-back position, while Reece Donaldson partnered Laurie Ellis in the heart of the defence. 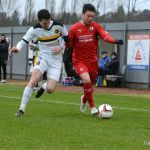 Kevin Moon and Ross Callachan were handed the task of anchoring the midfield, while Gordon Smith played up front alongside John Baird. Dumbarton’s stadium is picturesquely located between Dumbarton Castle and the River Leven but ,while the fans were taking in their surroundings, the players looked more concerned with the heavy-looking playing surface as they went through their paces beforehand. A brief downpour of rain, just prior to kick-off, did little to aid the conditions. 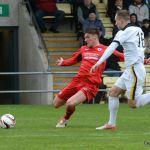 Ross Callachan got an even closer look at the turf in the opening stages, after he was felled by a challenge from Mitch Megginson, wide on Raith’s right-hand side. Cardle’s set-piece delivery found Anderson but, despite rising highest, his header went harmlessly wide. Raith seemed the more nervous of the two teams, perhaps unsurprisingly considering both sides recent form, and they almost gifted the hosts the lead after 6 minutes. 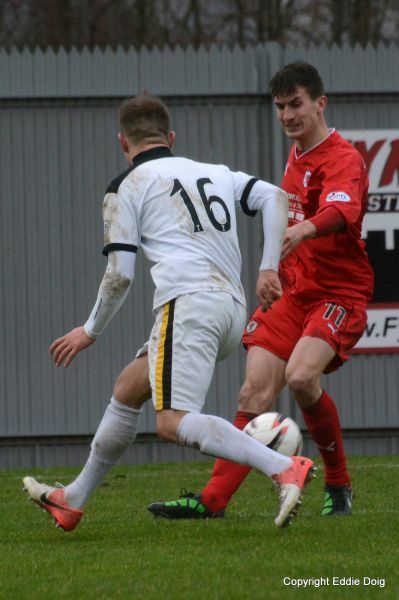 Thomson seemed unprepared for Robinson’s throw-out and he was dispossessed by Chris Kane. Thomson redeemed himself with an important sliding challenge but, with the rest of the Raith defence slow to react, Kane still had time to get up and take possession again, squaring to Nish who, despite taking the chance first time and having the majority of the goal to aim at, saw his effort thwarted by an excellent reflex save from Robinson. 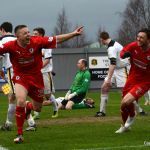 Raith then missed two chances of their own, the second of which was even easier than the one passed over by Nish. 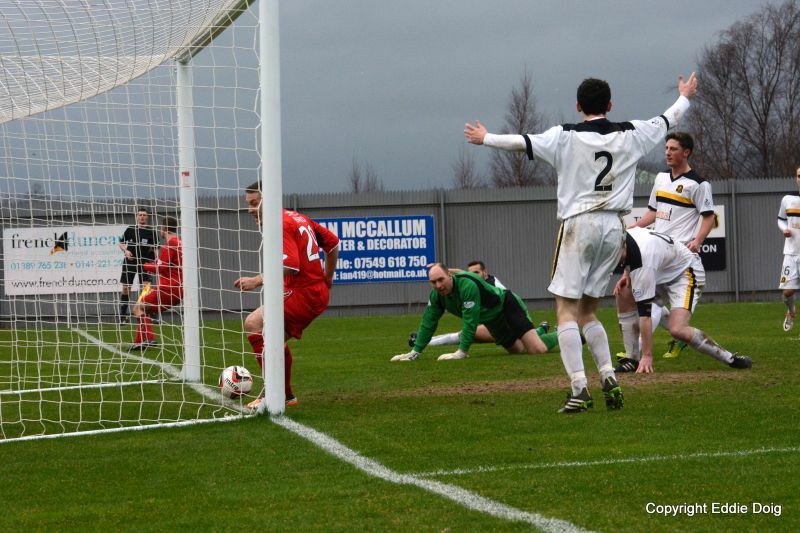 Firstly, Gordon Smith was unlucky to see his header cleared off the line by Kirkpatrick after a Cardle corner. 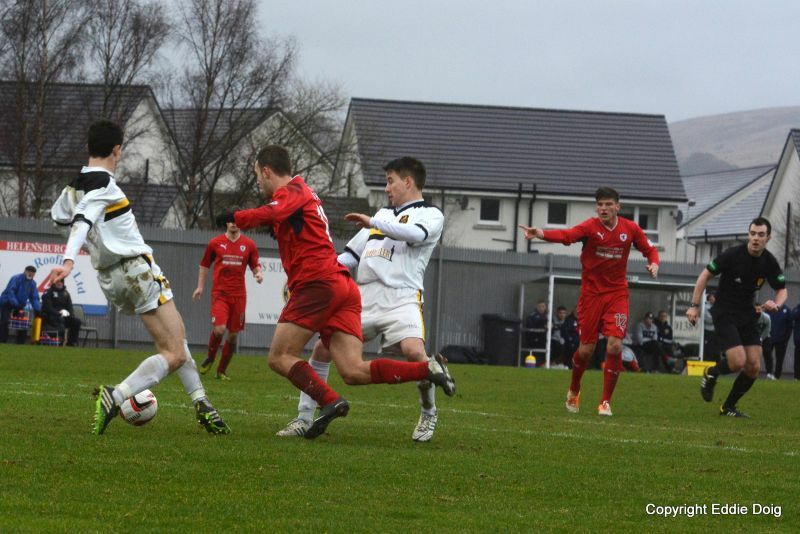 Then, a moment later, good play from Cardle freed up Callachan who sprinted into the box at an angle. 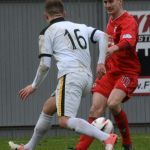 His cross-come-shot went beyond Stephen Grindlay in the Dumbarton goal but somehow Smith failed to get anything on it and it sped past both him and then Anderson at the back-post. Joe Cardle was looking lively and, this time, he picked out Jason Thomson on the right-hand side, who made his way into the box. But with players in support, his cut-back was poor and the chance was gone. 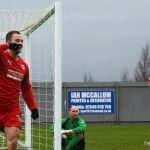 The Raith fans had a sense of foreboding about so many chances being squandered and, predictably, they were made to pay for it in the 24th minute. 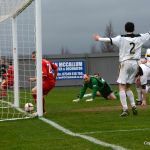 A long throw from Scott Linton caused confusion in the Raith box and Kane was allowed time to turn and shoot, bringing out a great save from Robinson. The rebound fell to Nish, however, and he finished with aplomb, hooking the ball into the net from 12 yards. Rovers weren’t behind for long, although their equaliser in the 29th minute owed much to good fortune. 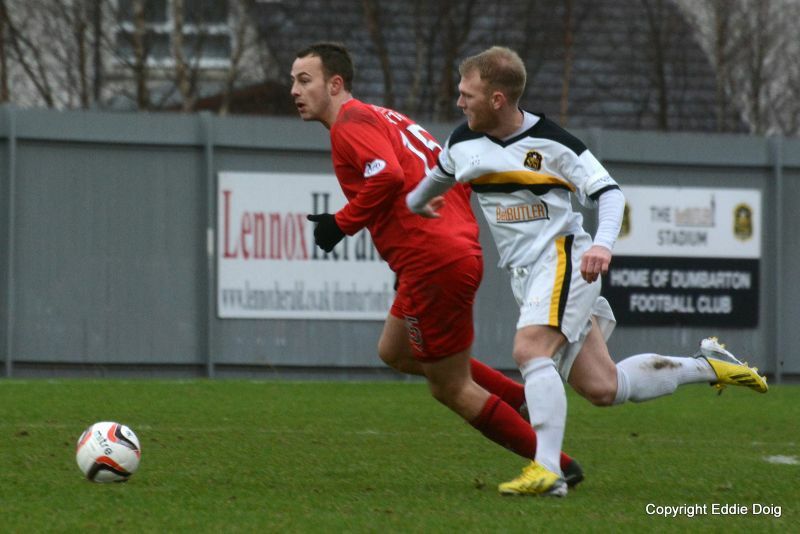 Scott Linton slipped when in possession on the half-way line, allowing John Baird to nip in and stride forward. 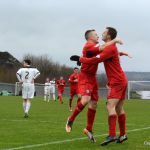 He played in Gordon Smith, who was in support on his left-hand side, and he redeemed himself after his earlier miss, with a well-placed finish past Grindlay. The away side were suddenly dominant again and were almost a goal up soon after. Firstly, a Callachan shot through a crowded area was tipped wide by Grindlay, then a dinked ball to the back-post from Smith was headed wide by Baird. 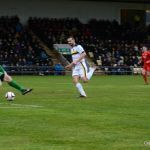 Just as Rovers were looking to assert themselves, however, they handed the initiative back to Dumbarton in the 37th minute. There appeared to be no danger as a long ball was played forward in the general direction of Kane but perhaps through a lack of communication, or perhaps even concentration, he suddenly found himself in behind Donaldson and Thomson. 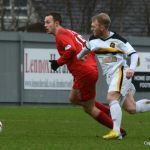 With the centre-half caught the wrong side, the on-loan St. Johnstone striker was able to pick his spot beyond Robinson. As good as the finish was, it was a goal that was eminently avoidable. Just before half-time after Kevin Moon gave away possession 35 yards from goal when Chris Kane sprayed a pass wide to Agnew and his cross found Megginson free at the back-post. His downward header had the sting taken out of it by Robinson, though, allowing Donaldson to hook it off the line. Despite Raith being slightly unfortunate to find themselves a goal down at half-time, the momentum swing towards Dumbarton at the end of the period meant that sound of the half-time whistle was something of a relief. 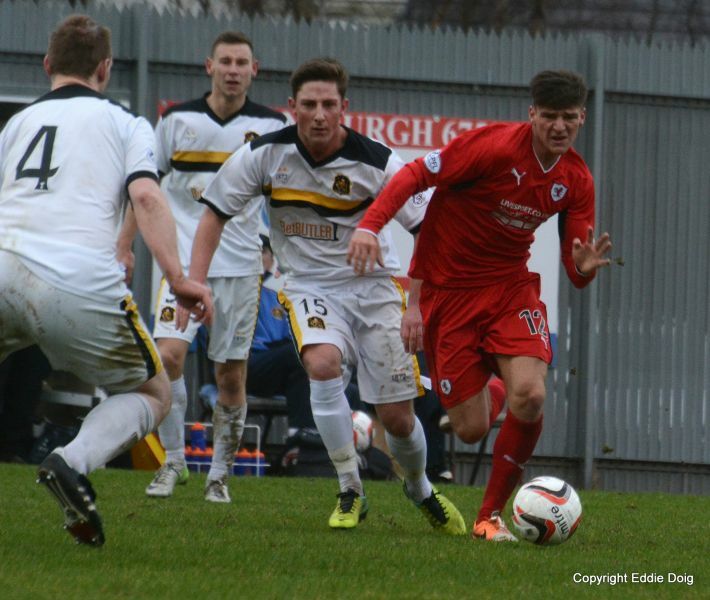 The second-half began with the home side looking to stretch their lead but Raith were level after 56 minutes. Smith found himself with a yard of space in the box and his shot cannoned off the inside of the post and, handily for Baird, straight into his path. The forward didn’t get the best of connections but it was enough to send the ball over the line. 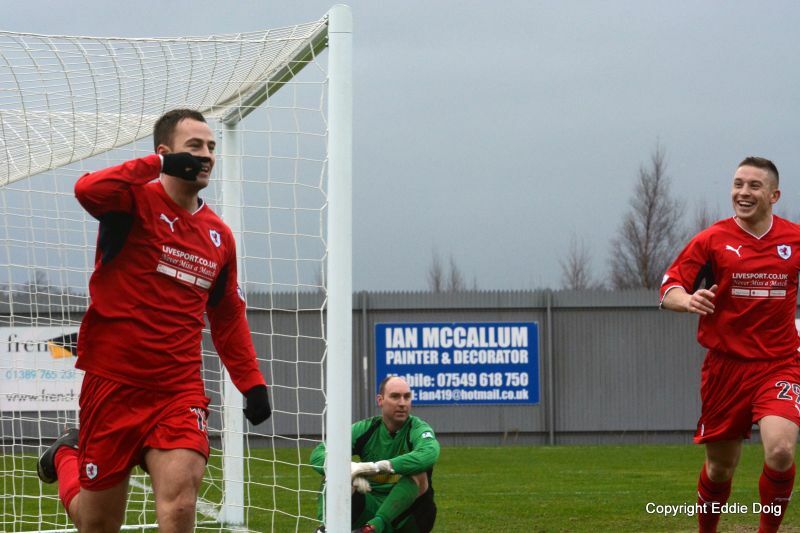 The celebrations had barely died down when Raith got their noses in front with a well-worked goal. Kevin Moon won possession in the middle of the park and fed the ball to Anderson, who had two to aim for in the box. His cross into the area was just right for Smith, who sent his header past Grindlay with unerring accuracy to put Raith 3-2 up. 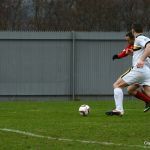 Rovers have never lost a league game from a leading position this season but they were pegged back almost immediately after a sensational strike from Scott Agnew. 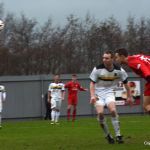 A free-kick into the box from Jordan Kirkpatrick was headed clear but while the Dumbarton midfielder could have been closed down quicker, his half-volley from 24-yards into the top corner was exquisitely taken. At this point, almost every attack looked like it could result in a goal and Dumbarton almost got the games seventh, with 20 minutes remaining. Kane outmuscled Laurie Ellis on the right-hand side and, with Thomson caught upfield, the forward had yards of space to run into. However, with players in support, he went on his own and sent his shot over the bar. The equaliser had a galvanising effect on Ian Murray’s men, while Raith seemed to retreat into their shell a little. The game became less frenetic and open as the Sons pushed for a winner. Robinson did well to tip a Paul McGinn effort over the bar, while Mark McLaughlin almost got lucky after a Garry Fleming shot caught him on the forehead and went just over. At full-time, both sides were probably disappointed not to have won the game, an indication that a draw was perhaps a fair result. 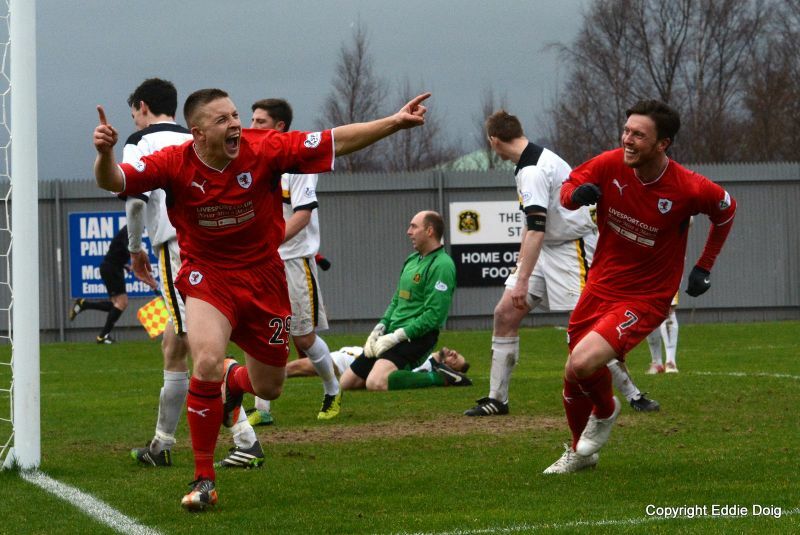 A point away from home against a team unbeaten in 2014 is a decent start to what is a busy few days for Raith Rovers and the focus now switches to Stark’s Park on Tuesday for an important home match against Alloa. Baird Smith and Moon combine, the later denied a shot on goal by McLaughlin. Cardle from Thirty yards whips in a free kick which Anderson headed past the post. Thomson fumbles a back pass, luckily Nish equals this with a poor shot at goal. Donaldson looking solid on his recall. Smith sees his downward header cleared off the line. 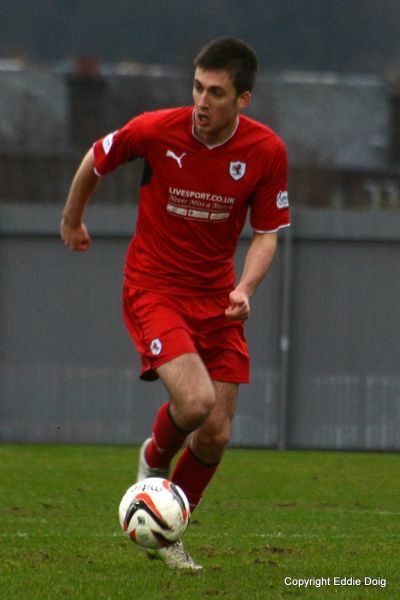 Callachan crosses across the empty goal, the ball is missed by the sliding Smith. Baird this time, missing Booths cross. Anderson playing the opposite wing does well to win a corner, alas Grindlay came out for the save. 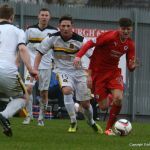 Raith repel a couple of Dumbarton forays. 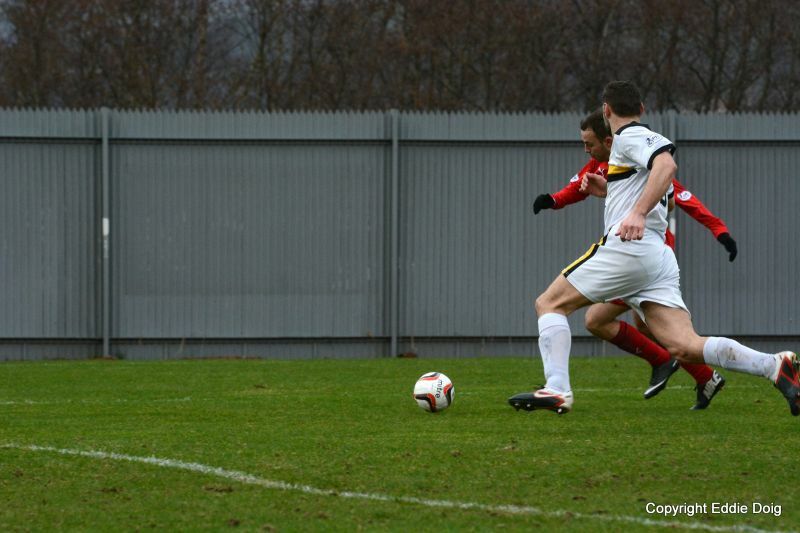 Gilhaney goes on his own down the right, however his shot was no better than a tame cross. 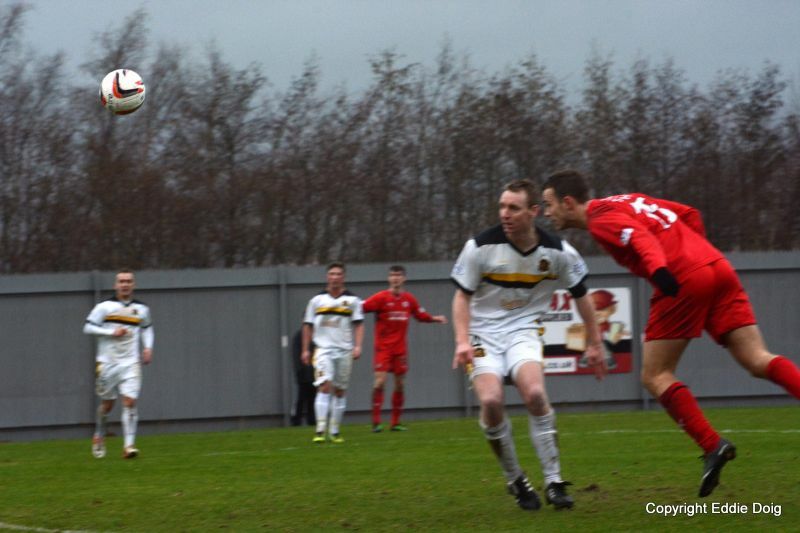 Goal Dumbarton, Nish heads past Robinson. Smith the provider, alas his cross was too strong and Baird could only head wide. Goal Rovers, a defensive error saw Baird capitalize and provide the pass that saw Smith slot home. 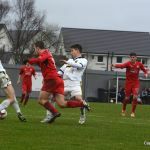 Callachan scoops the ball over the bar. Grindlay punches out from a corner, Callachan fires in from the edge of the area but the ball is deflected out for a throw. Smith stumbles but managed a cross to Baird who heads wide. Goal Dumbarton, Kane beat Donaldson in the box and slotted past the diving Robinson. Smith close to pulling the trigger is called back for offside. Moon slips up allowing Megginson a shot on goal, Robinson spills the save and Donaldson clears from a yard out. Megginson loose on the left slides the ball into Gilhaney who fails to connect. No changes for the second half. Booth causing chaos in the box, his tempting cross just cleared. Agnew slices a 24 yard free kick wide of target. Anderson being treated on the pitch. Grant returns to the field after Dumbarton graciously give the drop ball back to Robinson. Cardle crosses from a corner, the ball goes out of play after hitting an unsuspecting Anderson. Goal Rovers, Baird passes to Smith who's shot hits the post and Baird with his second attempt ushered the ball over the line. Goal Rovers, Anderson from the right passes to Smith who rose like a salmon to head past Grindlay. Goal Dumbarton. Agnew trapped a cross on his chest and fires home from the edge of the box. Agnew again from the edge of the box, this time his shot lacked pace and was stopped by Robinson. Ellis gets fouled by Kane but the ref gives the decision the other way gets the Rovers support on his back. Smith rising again, this time Grindlay claims the ball. Laurie having a word with the ref due to some dubious decisions. Reece losing out allows Miller free only to shoot high and wide of the target. Laurie petitions the ref again. 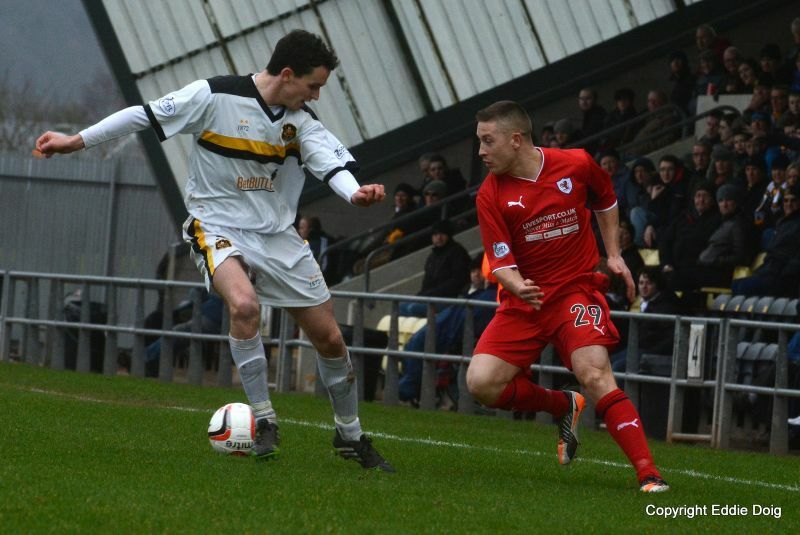 Robinson is forced to tip a long range McGinn shot over for a corner. Robinson kicks the ball sixth yards and finds Smith on the right, he audaciously hits a shot towards goal but it flew past the back post. SONS: Grindlay, McGinn, Linton, Graham, McLaughlin, Gilhaney, Megginson, Agnew, Nish, Kane, Kirkpatrick. Subs: Ewings, McDougall, Fleming, Murray, Miller, Smith, Phinn. ROVERS: Robinson, Thomson, Booth, Cardle, Moon, Anderson, Callachan, Donaldson, Smith, Ellis, Baird. Subs: Laidlaw, Fox, Spence, Mullen, Vaughan, Matthews, Bates. 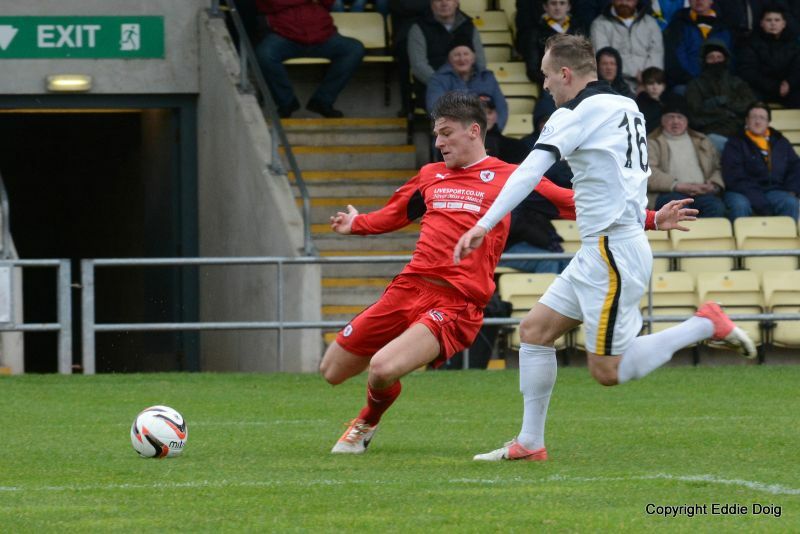 Ross Callachan prepares to fire in an early cross. Grant Anderson powers past Mark Gilhaney. Laurie Ellis in the Dumbarton box. Cardle keeps his eyes on the ball. 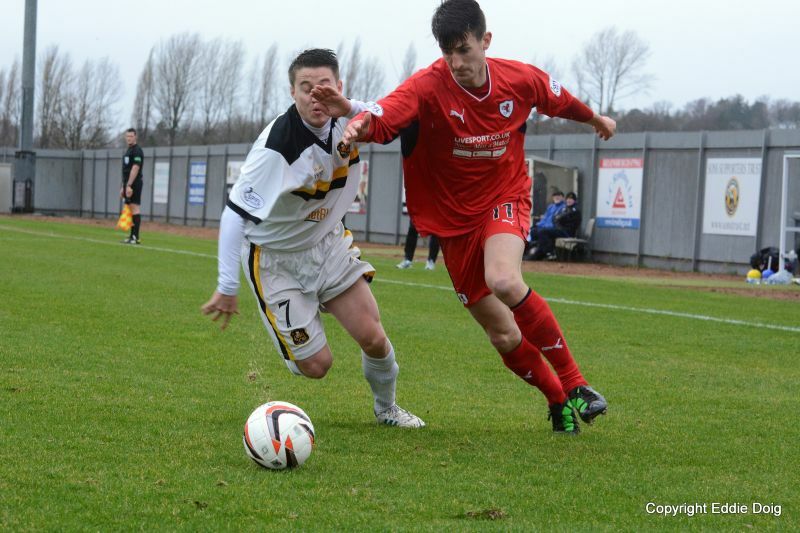 Joe Cardle brushes Paul McGinn aside. 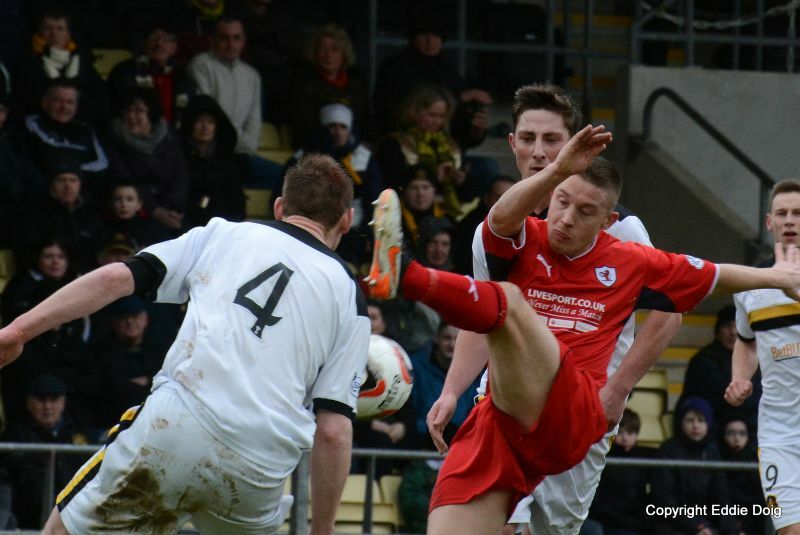 Baird splits the Dumbarton defence. 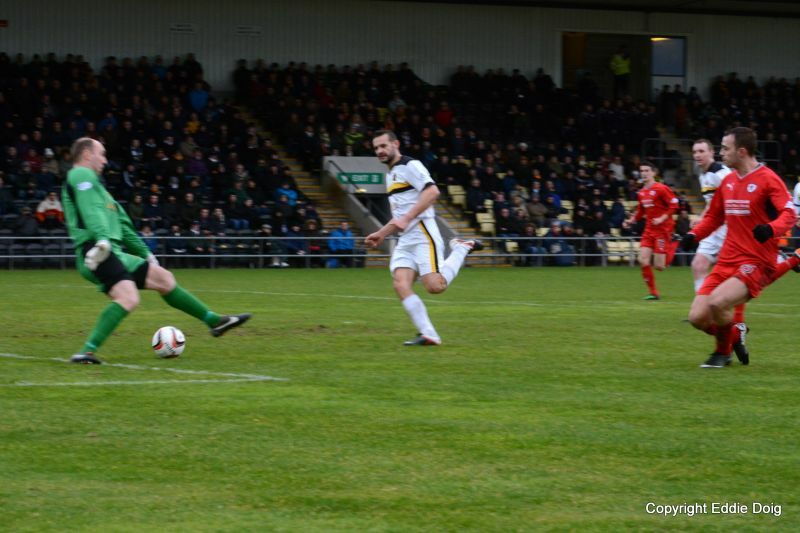 Smith fires home the equaliser. Baird gets his leg over the ball. Baird taps home the rebound. Baird and Cardle are happy "Rovers"
Smith makes time to look up. 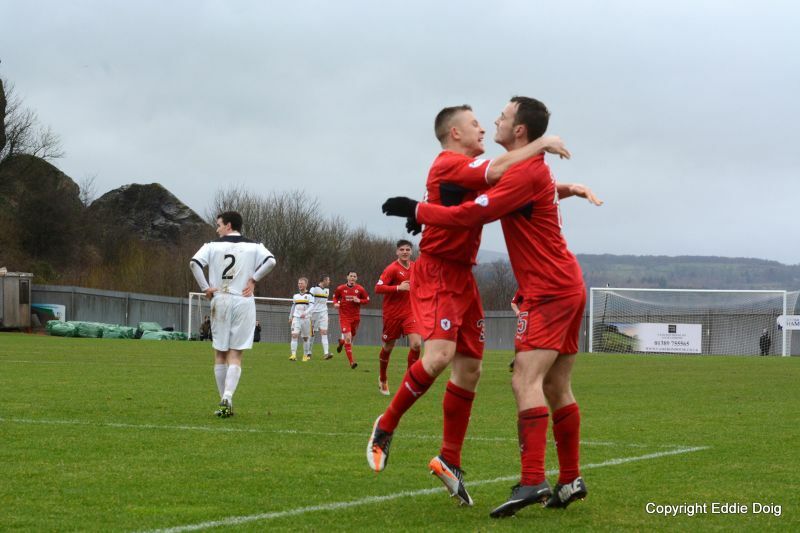 Smith and Baird celebrate goal 3. 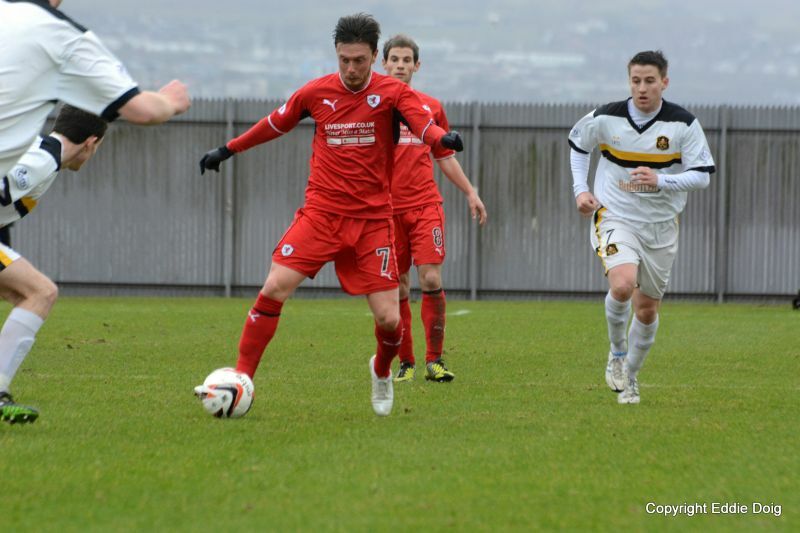 Callachan prepares to pass Graham watched by Kirkpatrick. 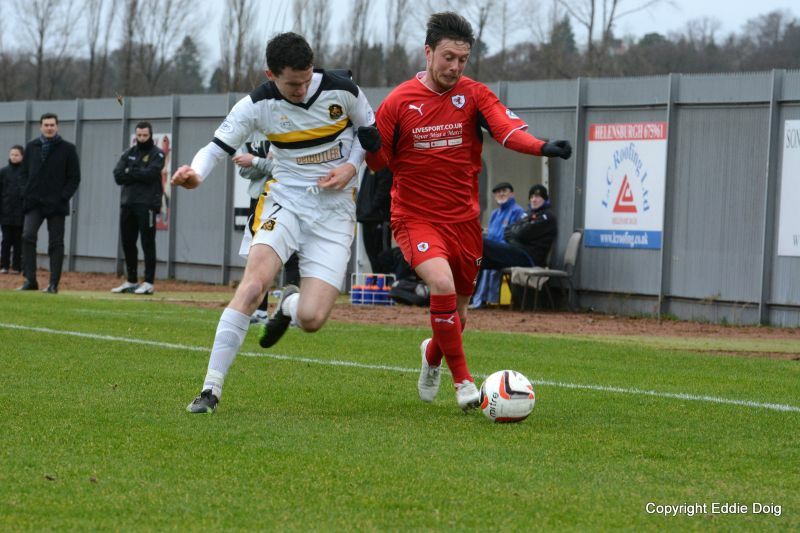 Smith splits the Dumbarton defence but is booked!